"Emphasizing a close link between development theory and the actual practice of economic policymaking, Rapley grounds the discussion in a way that will be much appreciated by both students and their instructors.... [He] writes with a rare clarity." Bruce E. Moon, American Political Science Review "Concise, yet all encompassing and meticulously referenced.... Rapley's study is determined to unravel the intricacies of development practice across the third world and map out its intellectual roots. The project certainly succeeds in these goals." Firooza Pavri, Progress in Development Studies"
This lucidly written book, thoroughly updated, provides both an assessment of the current state of development theory and an extensive survey of the impact of evolving policies and practices throughout the developing world. Rapley critically traces the evolution of development theory from its strong statist orientation in the early postwar period, through the neoclassical phase, to the present emerging consensus on people-centered development. 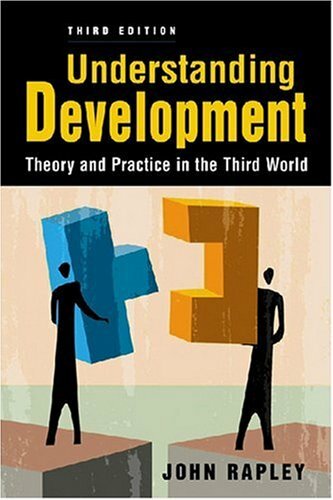 New to the third edition is a chapter on ""postdevelopment"" thought, as well as increased attention to the challenges posed by weak states and by critical environmental issues. Using a wide range of examples, Rapley shows where and how various approaches to development have worked or failed continuing to confront the question of why development remains so far out of reach for so many poor countries.